“Crossfire” was the name of one of my favourite Smallville episode and it’s a favourite because it was the episode where Lois and Clark had their first real kiss with each other. In Supergirl, “Crossfire” i think is about those caught in the middle of a band of thieves gifted with alien weapons to go on a robbing spree. Of course these thieves, lead by a Mr. Miner, were given these weapons by Dr. Mary-Alice of Cadmus Labs. Miner and his crew were robbing National City bank when Supergirl tries to stop them. James also tries to stop the thieves but is unable to and his father’s camera gets damaged as the thieves make their getaway. Also damaged is the local children’s hospital. Soon after the robbery, Cadmus Labs releases a video sowing fear in the citizen’s fo Earth by saying that if humans can grab alien technology and uses them for evil purposes then there should be no alien amnesty. We see later at an editorial meeting that people are starting to believe Cadmus’ rhetoric and a national poll indicated that 63% of people are in favour of repealing President Marsdin’s alien amnesty. The thieves next target a Diamond Exchange with a bigger badder weapon. Supergilr arrives on the scene but is unable to stop them again. Feeling useless and helpless, James goes to visit Winn at the DEO and gets him to reveal how they are tracking the alien weapon and learn the next target is the Federal Reserve. James, in a disguise, unsuccessfully tries to stop them but instead has to save people from a falling building that the alien weapon hit. The next day, Winn figures out what James was up to and why. James is tired of being the sidekick and having best friends that are superheroes. James wants to go out there and help people and wants Winn’s help with getting him a suit. Winn is against James’ plan knowing that it will get him killed. To help raise for the damaged hospital, Lena Luthor is throwing a fund raiser and asks Kara to attend since she considers her a friend. Tagging a long is Mon-El. Lena also wants Supergirl to come to offers protection at the event.At the fundraiser (filmed at Vancouver’s Central Library branck), Kara does a Mrs. Doubtfire switching back and forth between her personas as the situation sees fits. Meanwhile, the thieves want to target Lena’s fundraiser because a whole bunch of rich people are going to be there and wants Dr. Mary-Alice to help give them bigger and better weapons. Dr. Mary-Alice refuses and Miner threatens her but she doesn’t back down as she is hell bent on seeing her vision through and stopping the alien threat to protect her son and daughter. So the thieves attack the fundraiser but before hand, Mon-el and Kara share a nice dance where Winn and James notes their chemistry. The thieves attack and robs Lena and other guests of their jewelry until Supergirl arrives and they soon start blasting their weapons at her. James wants to help bu Winn cautions against it but he still throws some punches. 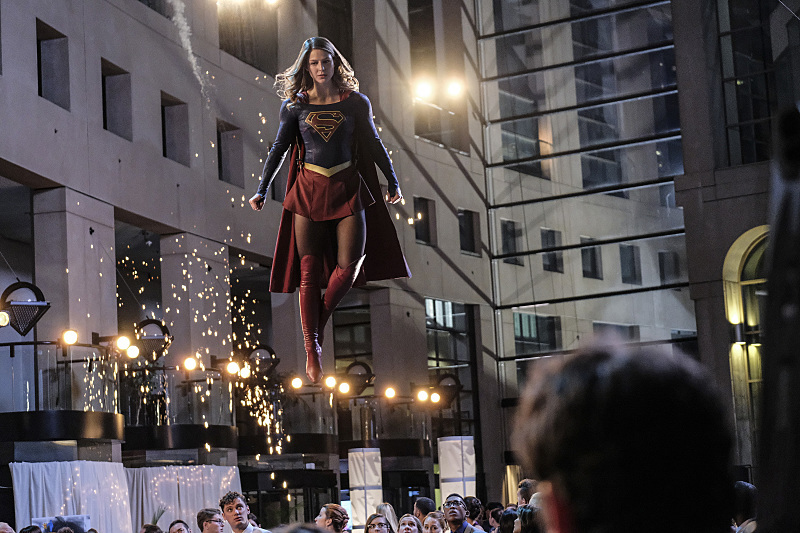 The thieves use the weapon to get a hold on Supergirl, Winn ducks underneath the stage and find Lena there trying to rig a device that can disarm the alien weapons. Winn realizes the fundraiser was a trap to lure the thieves. The two manage to get the device to work and the weapons are destroyed. And I predict here that Winn and Lena are going to get together over their shared love of science. The next day, Winn agrees to help James and has even made progress on his suit while James has come up with a cool superhero name that will be revealed soon. As Maggie is bring the trio of thieves to prison, Miner wants a plea deal so he can reveal who gave him the alien weapons. But then Miner starts to hear Dr. Mary-Alice’s voice in her head and the blows something up in his and his assoicates’ brain and they fail to the ground dead. We see Dr. Mary-Alice drive-by ready to move on to the next part of their plan. We opened up the episode with Maggie and Alex playing pool with Alex beating her handily. Alex learns that Maggie and her girlfriend broke up, which Alex appears pleased at the news. At the Diamond Exchange investigation, Alex tries to get Maggie to go out and have some fun to celebrate being single. However, Maggie reads it as Alex asking her out and wonders if she is gay. Alex denies it. However, later, when Alex visits Maggie at the alien bar drowning her sorrows over the prisoners dying on her watch, she comes to a revelation that she was right about her. Alex may not have said it out loud but she between the lines, she was saying that she can’t stop thinking of Maggie and she is perhaps the missing piece of the puzzle of why her dating life was a bust. You can just see Maggie waiting for Alex to say the words but alas she doesn’t and leaves. The comic relief of the episode was Kara getting Mon-el a job at CatCo as an intern names Mike. Kara also has given Mon-el the Clark Kent look. Miss Tesmacher takes an immediate liking to Mon-el that he takes advantage of by getting her to do his work and even making out with her. Kara is frustrated at Mon-el for not trying but after a talk with Alex realizes that she can’t mould Mon-el to what she wants but needs to let him be his own man. So Mon-el is fired from CatCo and now is seeking a job. Supergirl visits Lena and wonders why she didn’t tell her about her plans at the fundraiser. Their talk is interrupted by a visitor and we see it is Dr. Mary-Alice. Lena excuses herself to greet her guest. Dr. Mary-Alice apologizes for missing the fundraiser and Lena’s isn’t surprised and calls her mom. As soon as Dr. Mary-Alice said she was doing what she was doing was for her son and daughter, I wondered who will play them but I should have realized that it would be Lena and Lex.